Remember the chocolate shell ice cream topping that you ate as a kid? 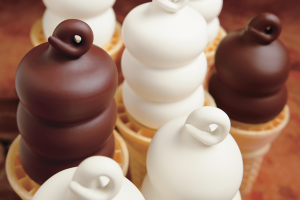 Whether it was a dipped cone from Dairy Queen, or the kind from the grocery store in a squirt bottle, your mother knew better than to ask what the ingredients were. You won’t be afraid of this version of chocolate shell. Adapted from Thomas Keller of the French Laundry, it has only two ingredients, both of them yummy. You’ll get an extra heart-healthy boost from the bittersweet chocolate. What a tasty way to get the health benefits of coconut oil! Want a little more coconut flavor? Use coconut butter in place of half of the coconut oil. Melt the chocolate in a small metal bowl set over a pan of simmering water. Stir in the coconut oil until blended, about one minute. Keep lukewarm until you’re ready to pour it over the ice cream. The topping will harden into a shell within a few seconds when spooned over ice cream.